If you can’t take more than 2 weeks off work to travel a new country, don’t worry – we’ve got you covered! Below you will find the perfect itinerary that outlines how you can see the country of Chile in only 2 weeks (without counting in & outbound from your home country). Please note that this itinerary was highly influenced by the flights available at the time. Because Chile is such a big country you will need to take various planes to reach the suggested destinations. Be prepared to travel long distances if you are planning to do this trip! However, we promise you it is worth it – The most beautiful places on earth are of difficult access to the human. If you are flying in from another country you will land in Santiago, the capital of Chile. If possible, try to arrive in the morning so you have the whole day to explore the city. You can find our recommendations on top things to do in this city here. Travel Tip: All touristic attractions are closed on Mondays so try to avoid this day when visiting. Santiago could be seen in one day if you would like to spend more time in other destinations. However we recommend to spend two days here if you are following this itinerary and travelling from far away because you will want to take a break before jumping on another plane. To reach the Atacama Desert, you will have to stay in San Pedro de Atacama, the closest town to all the main view points. To reach San Pedro you will have to fly from Santiago to Calama and then take a transfer from there to San Pedro. Travel Tip: There are multiple transfers at the airport that will take you to San Pedro – No need to book in advance. Try negotiating the price as you can get a discount if you also book your return transfer and it will be almost as cheap as the bus and a lot more convenient with under 1h travel. Preferably, try to fly in early in the morning so you still have the afternoon and night to take a sightseeing or stargazing tour. You will stay in San Pedro for 3 nights and spend the other two days doing sightseeing tours. You can check out our ranking of the best things to do here. Travel Tip: Avoid staying in Calama. There is not much to do here. Even if you have a very early flight, there will be transfer that takes you to the airport in the early hours of the morning from San Pedro. In fact, you will struggle to find a transfer that takes you to Calama as this is not something tourists often do. This is the longest travelling day of the itinerary and the only one that doesn’t enable you to do any sightseeing – But it is necessary. If you want to completely change scenery, you will have to take a flight back to Santiago and change at the airport to catch another flight to Punta Arenas in order to reach Patagonia. Once in Punta Arenas, take a 3-hour bus to Puerto Natales, the closest town to Torres Del Paine National Park. After the whole day travelling, you will reach Puerto Natales at night but (depending on your flight times) you should still have enough time to plan your upcoming days in Patagonia and book any tours you want to do. 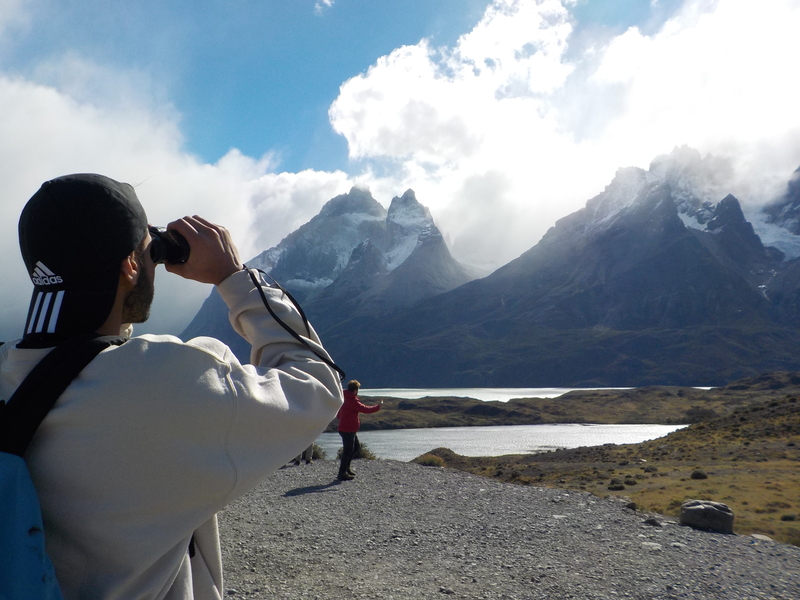 Day 7 & 8: Visit Torres Del Paine, Trek or cycle the beautiful sceneries of Patagonia. You can find our recommendations on how to best optimise your time in Patagonia here. We recommend that you take a full day trip to Torres Del Paine on your first day and that you trek or cycle the park or Puerto Natales on your second day. You will have to take the first or second bus in the morning that takes you back from Puerto Natales to Punta Arenas. You will reach here at about lunchtime, just on time to book your tour to Isla Magdalena to see the Penguins. However, please make sure to check the times of these tours here a few days in advance as not always they happen in the afternoon. If you really want to see this, you might have to adjust your trip depending on the timetable. However, there are also other trips you can do in Punta Arenas such as Tierra de Fuego or smaller treks. Once you reach Santiago airport, you will need to catch a taxi that takes you to the bus station where you can hop on a 1-hour bus to either of these seaside destinations. If you are unsure of which town to stay at you can find our recommendations here. Day 13: Catch the bus back to the Airport and fly home! You will need to get a taxi that takes you from the bus station to the airport.